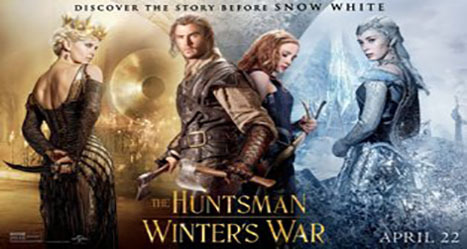 The Huntsman: Winter's War is a sequel of the 2012 fairy tale movie Snow White and the Huntsman. The movie is directed by Cedric Nicolas-Troyan and stars Chris Hemsworth (the huntsman), Charlize Theron (Queen Ravenna) and two new characters Jessica Chastain (Sara) and Emily Blunt (the Ice Queen). The movie plot is a bit weak but the actors try their best to make the film watchable. Even prominent actors like Hemsworth and Theron fail to lift up the movie with the only good part about the movie is the costumes of the two queens.